Gianna is not a Michelin Star cook. She is not the proud chef of her own restaurant. Gianna is simply an "ordinary" Italian Mamma, who loves cooking and is extremely good at it. Everybody who has had the pleasure of trying one of her dishes is raving about her cooking skills: Her pizze, for example, are a mouth-watering combination of a perfect base, genuine mozzarella, homemade tomato sauce and fresh toppings, and reveal their wonderful flavour after their passage in a wood fired oven. This shy woman lives in Le Marche, a beautiful and central region of Italy perhaps less known as her Tuscany or Umbria neighbours but with a strong food culture. Gianna prefers to prepare dishes for guests in the comfort of her own home, surrounded by her beloved utensils, but will on occasions cook in the kitchen of another house should the menu require perfect timing. Other signature dishes of hers include the very simple but heavenly combination of melon and prosciutto (cured ham), pork or beef stews served with grilled vegetables or scrumptious fruit tarts to give the meal a final sweet note. With the importance of the Slow Food movement, which incidentally was started in Italy by Carlo Petrini in the mid-eighties, authentic dishes prepared with local, often organic ingredients and traditional farming and cooking methods are getting more popular every day. People's concern for what appears on their plates is growing, and easily found information is helping them with their food choices. 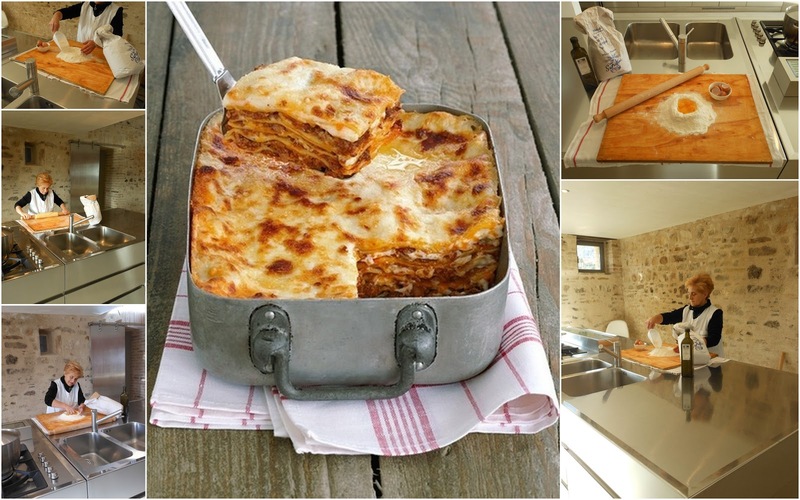 Given this prominent trend, Gianna's cooking style and the succulent lasagna Vincisgrassi are here to stay for many, many more! 2 cups freshly grated Parmigiano-Reggiano. 1. Place 3 tablespoons butter in a large saucepan over medium-high heat. Add prosciutto and sauté until starting to brown. Lower heat to medium-low and add onions, celery and carrots. Cook until soft but not brown. Stir in tomato paste and cook 2 minutes. 2. Heat 4 tablespoons butter with 2 tablespoons olive oil in a large sauté pan. Add veal and sauté over medium-high heat until meat starts to brown. Transfer veal to the saucepan, draining it well. 3. Discard fat in sauté pan. Return pan to medium-high heat, add Marsala and boil, loosening residue in pan with a wooden spoon. Cook until reduced to 2 cups. Pour into saucepan. Add veal stock, 2 cups chicken stock, cloves and herbs. Partly cover. Simmer 2 hours. Season with salt and pepper. Set aside. 4. Place porcini in warm water to cover and soak. Meanwhile, combine cream and remaining 4 cups chicken stock in a large saucepan, bring to a simmer and cook about 1 hour, until thickened and reduced to 2 cups. Pour into a blender and process on low, then higher speed. Add egg and process briefly. Taste and season with salt and pepper, strain into a bowl and set aside to cool. 5. Squeeze porcini dry and chop. Add remaining olive oil to a skillet, add all mushrooms and sauté until cremini have started browning. Fold into veal mixture (ragù). Set aside. 6. Bring a large pot of salted water to a boil. Have a large bowl of salted ice water ready. Line a large baking sheet with kitchen towels. Add pasta sheets to boiling water one at a time, cook each 2 minutes then place in ice water. Drain pasta sheets and spread on towels to dry. 7. Preheat oven to 350 degrees. 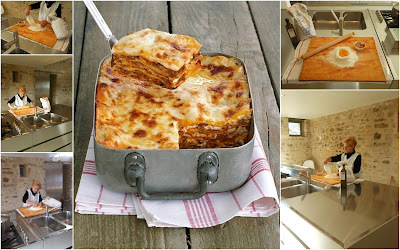 Brush a 9-by-13-inch lasagna pan with remaining butter. Lay a sheet of pasta in pan. Sprinkle with 1/3 cup cheese. Spread about 1/4 of the ragù over cheese. Spread on 1/2 cup cream sauce. Continue layering until covered with last sheet of pasta. Spread with remaining cream sauce, then remaining cheese. 8. Bake 25 minutes, until bubbling. Increase heat to 400 degrees and bake about 5 minutes to brown top. Remove from oven and let stand 20 minutes before cutting in squares and serving.